For my Database Application Design class we created a server based database application for University of Michigan’s Special Collections Library. Our project focused on archival realia - three-dimensional objects (such as pens, glasses, bridal dresses etc.) usually received from donors. realia is difficult to describe and catalog. To compound this issue, the preservation of realia is expensive, and the space and money required for their maintenance is wasted if they are underused. Thus, an application targeted specifically to the organization of and access to realia in physical spaces would help archivists maintain better control over these assets, and would also encourage patrons to actually use the objects. Creating such an application was our aim. Our project began with two user interviews to more fully understand the problem facing archivists. From these interviews, we created a series of detailed task lists for the major actions a user would need to complete in our system, and developed a visualized representation of these tasks. 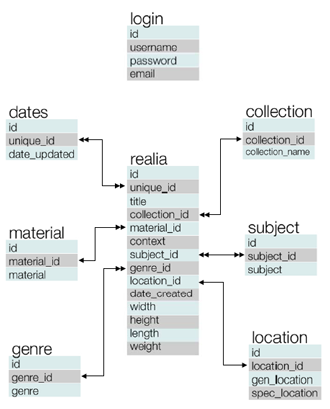 We also spent time talking through and diagramming the best ways to join each of the tables, and created a relational database document in order to capture these relationships. Double arrow-heads shows one to many relationships in the above diagram. Our final product is a database application with an easy-to use front-end where archivists can manage individual objects as well as larger collections. Our system takes into account realia-specific information for which other archival databases do not accommodate. We have included the ability to not only add, edit, and delete individual items, but do these same tasks with collections, genres, and material types. Users are also able to view their entire catalog of realia, listed by associated collection, as well as search for specific items within the database. Although there are some limitations to the first version of our product that restrict users’ actions in ways that are not ideal, our system provides a solution to a problem that has heretofore been unsolved. The ways in which archivists currently manage realia are inefficient and problematic; and Keep It Realia allows users to easily collect and manage all of the necessary data to keep track of these important objects. Learned to analyze a complex information management system. Learned how to deliver useful solution by correctly understanding the context of the problem. Learned how to establish a relationship between front-end with Back-end and how an efficient database can be built (indexing, normalization and building relationships by numbers as long as possible).